The Coyote, usually associated with the open lands of the west, is now found throughout the United States. Not native to Ohio, its presence here shows the animal's ability to adapt to new environments. Coyotes' good sense of smell, hearing and vision, along with being sly, enable them to live in urban areas. Coyotes typically hunt for mice or other rodents at night. Suburban coyotes are often drawn to backyards by garbage and outdoor feeding of pets. It is not uncommon for the Coyote to attack and kill smaller dogs. 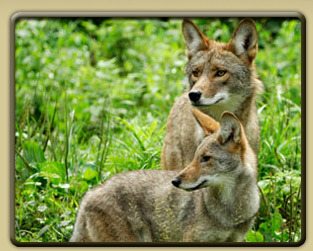 Coyotes \ki- ‘ o-te\ Famous for being heard and not seen, these carnivores mammals look a lot like dogs. The coyotes mate between February and April, with the gestation period lasting from 60 to 63 days. Litter size ranges from 1 to 19 pups, with the average litter size usually around 6. These large litters act as compensatory measures against the high juvenile mortality rate. The pups are born blind and with floppy ears and open their eyes in about ten days. The pups begin to come out of their den when they are about three to four weeks old. They are weaned when they are about a month old. Once they are fully weaned, both parents feed the pups regurgitated food. Male pups will leave their mother when they are between six and nine months old. Female pups will stay with their mother's pack. Male and female coyotes pair off and mate together for several years.